Looking for the perfect comfort food? Our Cheesy Bacon Macaroni Pasta Sides combines the classic flavors you love and enhances delicious dishes like our Chili Bacon Mac & Cheese. Cheesy Bacon Macaroni Pasta is rated 3.0 out of 5 by 10. Rated 3 out of 5 by FoodNerd13 from Why are pasta sides to watery or soup like? Answer: The ingredients needed to cook the pasta sides original recipes from several years back. 1 1/2 cups water 1 tablespoon margarine (optional) 1 pkg. Knorr Pasta Sides To give the pasta sides a creamier taste and texture Knorr changed the recipe to include milk. The current ingredients needed to cook the new improved recipes are. 1 1/2 cups water 1/2 cup milk 1 tablespoon margarine (optional) 1 pkg. 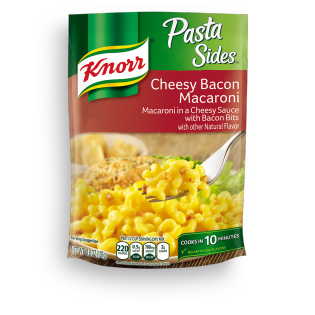 Knorr Pasta sides The dehydrated pasta and sauce of the original and new about same size and servings. Knorr added milk to improve taste and texture but forgot to reduce water amount needed. Reduce the water amount by 1/2 cup when cooking to get the best results. Rated 5 out of 5 by Chaduke from Best Knorr side I've had This is one of the best instant sides I've ever tried. The cheese sauce just has fantastic flavor with the addition of little bits of bacon. So much better than any type of mac and cheese you can buy, and quite honestly I prefer it to traditional homemade. Rated 2 out of 5 by sb7891 from Eh I tried this the other day. Was not as good as I thought it might be. It's like the boxed mac and cheese. Bacon flavor did not help.It was edible, but not worth a second purchase. Rated 5 out of 5 by feefee from Good base for tuna dish. I decided to make this to mix with my tuna salad for dinner. It turned out absolutely delicious! For the tuna, I did tuna in water, egg, white onion, and light mayo (and salt and pepper). Mixed it in with this pasta once it was done, and the result was awesome. Highly recommend.